Ashley and Jon Barchus are currently the parents of the children who live in the orphanage, “Yedidja” They are also in charge of the day-to-day operations and needs of the organization, Arbre de Vie. They are volunteers from the United States on a long-term commitment to love and take care of the children in the center. 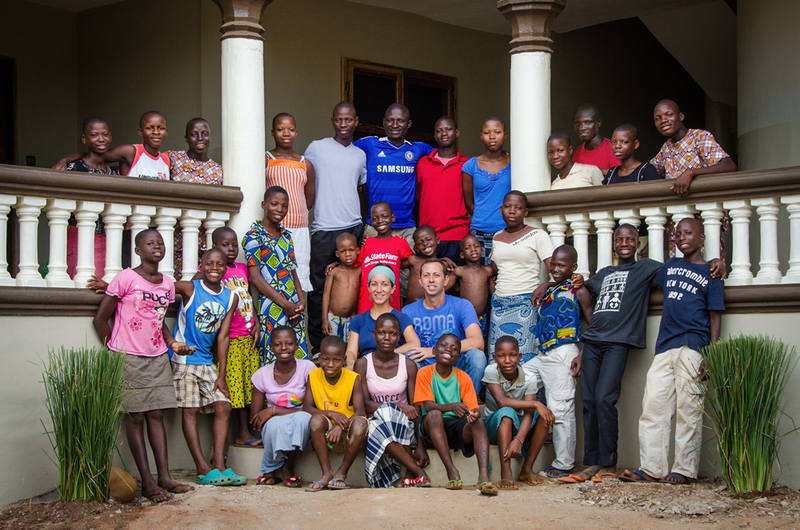 Since moving to Benin in 2010, Jon and Ashley have taken over the majority of the responsibilities of not just being parents to the children but also the running of the non-profit organization in Benin. Jon is the Executive Director of Arbre de Vie in Benin and Ashley is the Director of the Orphanage and of Social Assistance. Jon’s work experience as a registered nurse in the United States as well as some time in construction has helped him a great deal with the work he now does on a daily basis. He has overseen all the construction projects at the center. Since medical care and attention is so limited in West Africa, Jon also provides care for the children and local people’s basic medical care needs as they arise. Ashley’s experience as a youth pastor has prepared her to care for and love large groups of kids, teach them Biblical truths, organize events and camps, and compassionately reach out to those in need in the community. Jon and Ashley feel called to this ministry and therefore left their families, jobs, and lives in the United States to care for these children in need. They have been living in Benin full-time since early 2010 and accept the children of the orphanage as their own. They are extremely grateful for the opportunity to be parents to this incredible bunch of kids and are glad to be serving the Lord with their lives in Benin. As mentioned previously, Jon and Ashley are strictly volunteers with Arbre de Vie. They receive no salary from the non-profit organization and are solely supported by donations from supporters that wish to give specifically to them. If you feel led to donate to the Barchus’ so they can continue living in Benin and caring for these wonderful children, please click our donation icon or go to our donation page to donate specifically to the Barchus’. How did Jon & Ashley get to Benin? I, Ashley, first felt called to Africa my senior year of college, 2006. Soon after this feeling began, missionaries from Africa came to speak at our chapel service and they were missionaries in western Africa. Where? You guessed it, the country of Benin. They invited me to stay with them, which I did, and they connected me to the orphanage of Arbre de Vie. When I met the children of Arbre de Vie for the first time, the Lord really opened my eyes and my heart to see them and love them through His eyes, which was my prayer. After returning to the States from my time in Benin, I was heartbroken over these children and totally and completely in love with them as well. Jon and I had been dating for several years by the time I returned home and just weeks later got engaged and soon after we were married. The month after we got married I led a mission’s team from Beavercreek Church of the Nazarene to Benin and Jon took this journey with us. During this time we again spent time at the orphanage Yedidja and after meeting the children Jon finally fully understood my heart for them. At this point, he surrendered the plans for his life to the Lord and after going back and forth to Benin several times over the next two years, the calling of the Lord on both of our lives became clearer. We both very clearly felt that we were to move to Benin to become parent figures for the children. Finally in early 2010 we headed to Benin to establish our new life. We didn’t know the language (French) or have things all figured out, but we knew God would provide and care for us and He has certainly proven that to be true. It’s true that we left our lives behind. We both left jobs we loved and family and friends that we adore to be here in Benin. It is also true that the stresses of life in this extremely different culture and third world country are overwhelming many days. However, the additional truth is that I am living a life that is better than I could ever have dreamt of because I am living it with and for Christ. I love this life, the opportunities, the meaning and purpose, and most of all, the opportunity to be parents to these most incredible kids.